In the sneak peek post of last week’s How to Get Away with Murder, I was pretty harsh with Sam Keating (Tom Verica). I basically called him a liar, cheater, and murderer. Of course, this was before the new episode, so it’s possible that I was wrong. Well, I want to tell you that I was wrong–Sam is even WORSE than I thought! He’s a master manipulator and I absolutely believe he killed Lila (Megan West). He seduced and slept with his student…who was a virgin…and got her pregnant…and probably then killed her. GUILTY! When Bonnie (Liza Weil) confronts Sam about knowing that Lila was pregnant, he tries to manipulate her too! I’m so glad Bonnie goes to Annalise (Viola Davis) to tell the truth. Bonnie really is here for her boss and cares deeply for Annalise. I’m not too happy that Bonnie is fired, though something tells me Annalise might have a bigger plan in play. What surprises me most about last week’s show is how I start to feel sympathetic towards Rebecca (Katie Findlay). Lila really was her friend, and seeing their friendship in flashbacks allows me to better understand Rebecca’s bad attitude and trust issues. I also understand why she’s so hellbent on exposing Sam, regardless of what Wes (Alfred Enoch) and Annalise have to say about it. In tonight’s episode, “Kill Me, Kill Me, Kill Me,” we’ll finally be reaching the moment we’ve waited all season for–#WhoKilledSam. 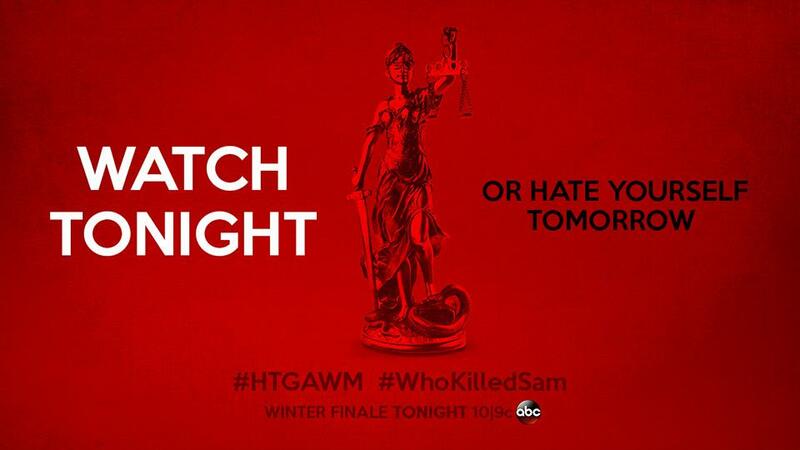 According to ABC: On the must-see winter finale of How to Get Away with Murder, it’s the evening of the bonfire and we finally learn what exactly happened on the night of Sam Keating’s death! WOW! I’ve been wondering why Annalise is so willing to keep Sam around. We learned that their relationship started off as an affair, with Sam cheating on his first wife. And last week Annalise said that she believes everything that’s now unfolding is probably a result of bad karma. I don’t like to wish ill on people, but I really don’t think I’ll be sad to see Sam die. He has this potential for violence that lurks under a thin veneer of civility. So I think someone (Rebecca or Annalise) kills Sam in an act of self-defense. But what I’m most eager to see is how long the Keating Five are able to get away with THIS murder!